CentOS vs Ubuntu, Which One Is Better? CentOS vs Ubuntu: Who Wins the Battle? Want to try a new Linux distro? If so, you must be looking and researching for the best one. The vast number of distros have already made you confused. I’m here to help you with your confusion. Ubuntu and CentOS are two of the best Linux distros. You can choose one of them. 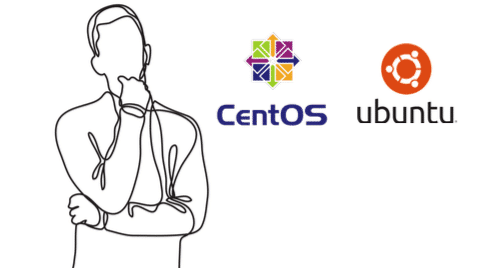 Still confused between CentOS vs Ubuntu? Well, both of them are free, open-source, and community supported operating systems. They’re easy to download, install, and use. Their stability, reliability, and performance almost create a CentOS vs Ubuntu server battle. As you’re here, you’ve already escaped from a way tougher decision to choose one from hundreds. Now, you have to choose from just two distros. Here I’m to assist you to choose the perfect one for you. Today, we will be going through CentOS vs Ubuntu server comparisons. No matter how experienced you are, it’s a tough decision to choose a better operating system for your personal use or business. First of all, let’s start from the short overview. CentOS is a free, open-source, enterprise-class, and community supported Linux operating system. It’s first released in the market in 2004 as a derivative of RHEL. But it works independently under new CentOS governing board. CentOS is highly reliable, stable, and customizable. On the other hand, Ubuntu is also a free, open-source community-supported Linux distro based on the Debian architecture. It came first in the market in 2004 with a rich set of features and packages. It’s also highly stable and customizable. CentOS vs Ubuntu server, it seems hard to choose which one is better. Let’s begin. It’s possible when a distro is perfect for someone, but the same distro is not what you’re looking for. So, don’t search for the best. Go with the distro which will be the right one for you. CentOS vs Ubuntu server comparisons can make you confused. So, I’m here with 15 essential facts that will help you choose the perfect distro for you. 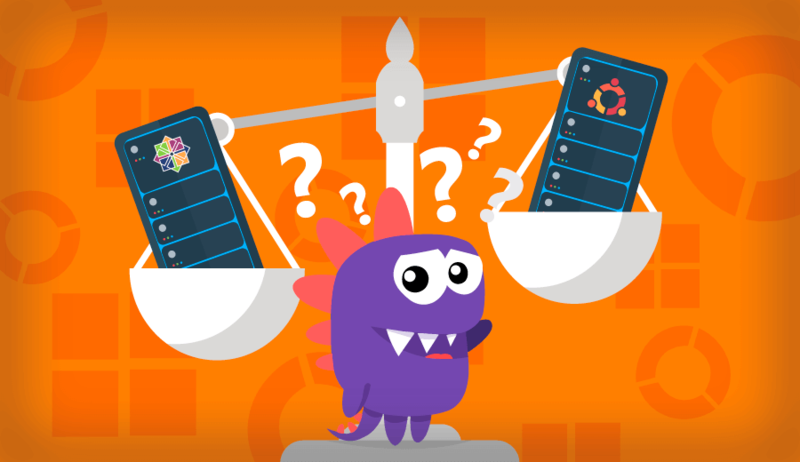 Let’s check out the minimum system requirements for both Ubuntu and CentOS. Requirements for CentOS varies with its versions. For example, to control via a graphical user interface (GUI), CentOS 5 requires at least 128 MB free space. At the same time, to operate via command line CentOS 5 requires a minimum 512 MB memory space where CentOS 6 needs at least 392 MB. Again, CentOS 5 and 6 have requirements of at least 1GB, and CentOS 7 has 2GB memory space requirement overall. CentOS 7 requires minimum 10GB hard disk space, but for better performance 20GB hard disk is recommended. On the other hand, Ubuntu desktop edition has system requirements of 2GB RAM, 25GB hard disk space and 2 GHz dual-core processor. It also requires 1024×768 screen resolution with VGA capability. So, we can see that Ubuntu has higher requirements. But, isn’t it obvious? Let’s check other vital facts of CentOS vs Ubuntu. The installation process for both CentOS and Ubuntu is straightforward. They use different installers for installation. Redhat Anaconda installer is for CentOS installation. On the contrary, Ubuntu uses its own installer. With Ubuntu, you just need to have the DVD or USB Flash that already contains the required version of Ubuntu. Then you have to boot your computer using one of them. It’s straightforward even for the beginners who have no such technical knowledge about it. On the other hand, to install CentOS, first, you have to burn a DVD or USB. CentOS provides the required ISO image to download and write it on the CD-ROM. Everything ISO, Minimal ISO, and DVD ISO; 3 versions are available for CentOS installation. You will get some configuration options to select among them before the installation. The most interesting part of CentOS vs Ubuntu is their basic architecture. CentOS is derived from RHEL (Red Hat Enterprise Linux). Meanwhile, Ubuntu is a Debian architecture based free and open-source operating system. Well, at the beginning of the installation you can choose the Gnome GUI for CentOS as your desktop environment. The desktop contains some default icons at its left side. You can change their places to anywhere on the desktop. With Gnome, you’re going to have a desktop with two panels or bars. The bottom bar contains the running applications’ icon. And the top panel contains buttons for applications and places, and it also shows the icon of running applications on your computer. You can install Ubuntu with Gnome desktop environment too. It comes with two panels on your desktop. The top panel or bar contains notifications and running app windows. The left bar is kind of a dock type panel. It contains important active applications. You can move it to the top or bottom. It’s hard to get a conclusion on CentOS vs Ubuntu performance. Both of them are highly stable, reliable, and faster. The better your hardware, the faster they will perform. Actually, the performance depends on the configuration. If you can configure them accurately, they will give you their best. It doesn’t matter what you’re using between CentOS vs Ubuntu; you should make sure that you secure them properly. To get better performance, it’s a must. Ubuntu comes with frequent updates, user-friendly interface, leading edge, and feature richness. On the other side, CentOS doesn’t provide frequent updates and also it’s not rich in features. But it’s lightweight and highly trusted. CentOS actually is more secure than Ubuntu. CentOS vs Ubuntu server, both have their own software management system. The important thing is they have entirely different backgrounds or architectures. CentOS is derived from Red Hat, and at the same time, Ubuntu has directly come from Debian. That’s the reason why they have different software managers. On the other hand, the software management system of RHEL is RPM (Redhat Package Manager). But CentOS can’t directly use it. First, it has to download and install RPM packages via yum from the central repository. All distributions based on Debian have a standard package management system called Apt. Apt is the Advanced Package Tool. So, Ubuntu uses Apt to manage its software packages. It’s a very powerful software management tool. You can also use the apt-get package manager to download DEB packages. It’s also capable of handling version upgrades. Ubuntu and CentOS, both have software resources, and all of them are compatible with the respective system. You’ll get different software packages there available for download and install with the latest versions. It will surprise you that there are more than 40,000 applications are available at Ubuntu’s software center. Unbelievably, Ubuntu comes with huge repositories. And, of course, this feature attracts different types of users amazingly. Meanwhile, CentOS software source has limited repositories such as CentOS Extras, CR, CentOS-Fasttrack, Software Collections, CentOSPlus, and more. Only CentOS-Extras is by default enabled. You can enable other repositories to use them. It may not provide thousands of packages like Ubuntu, but it has what you need. Both CentOS and Ubuntu have third-party repositories. So, CentOS vs Ubuntu, who wins this fact? It’s very common and obvious that users generally expect some applications in the system by default or pre-installed as soon as they installed the distro. Every single operating system has some application by default like web-browser, calendar, and media player, so do Ubuntu and CentOS. And, the interesting part is you can change those default applications anytime. Both the distros have Mozilla Firefox and Videos in common. Besides, Ubuntu has Thunderbird Mail for mailing, Rhythmbox for music, and Image viewer for images. With Gnome desktop environment, Cents comes with Cheese and a set of LibreOffice Tools. Moreover, Ubuntu comes with a massive application package compatible with Ubuntu. CentOS vs Ubuntu, which one comes with better GUI? Well, according to the graphical user interface (GUI), Ubuntu and CentOS need one same tool, and that is the Gnome Tweak Tool. If the desktop environment on both the operating systems is Gnome, it handles the customization in almost the same way. With CentOS, you can get different options with the appearance of desktop, workspaces and other settings. You can customize them using the Gnome Tweak Tool. It comes with different attractive designs and themes. With Ubuntu, you will find many icons and themes for your desktop in the Gnome world. You need to add the Gnome shell extension to your browser. Then you can download and install extensions for theme and icon customization. The Ubuntu Gnome Tweak Tool will give you the options for customization. Both CentOS and Ubuntu come with fantastic customization options. You can go to the system settings and there you will get options to customize your computer. You can customize the appearance, brightness and look, language support, color, Bluetooth, display, and some other settings. You already know that you can customize from Gnome Tweak Tool in CentOS. And, with Ubuntu, you can use Ubuntu Gnome Tweak Tool to customize your computer. So, the CentOS vs Ubuntu performance is getting more interesting, isn’t it? According to the desktop environments, Ubuntu wins the battle of CentOS vs Ubuntu. Well, both distros come with the support of different desktop environment on them. For example, you can use a desktop environment like Gnome, KDE, MATE, Cinnamon, and XFCE on the CentOS operating system. You already get Gnome and KDE GUI directly with CentOS. You just need to confirm which GUI you want to choose before installation. You can download and install other Desktop environments via yum command. At the same time, Ubuntu provides support for Gnome, Budgie, XFCE, LXDE, KDE Plasma, and MATE as well. Among these environments, Gnome is the default GUI that comes with Ubuntu. Let’s check out who wins the CentOS vs Ubuntu performance battle. For the software update and system upgrade, both CentOS and Ubuntu have their own specific way and system. With CentOS, users have to check for an update manually via yum (Yellowdog Update Manager) command. If there’s an update, you can install it manually via yum command. It’s a must to write the correct command line. Meanwhile, to check the most recent update of any app, Ubuntu has a software update utility tool. It can check any update faster than CentOS. You can update your apps from here. So, basically, it’s easier to update software or upgrade the entire system with Ubuntu. Then it’s clear that Ubuntu is the winner of the CentOS vs Ubuntu performance battle in case of update and upgrade. CentOS and Ubuntu have a different release cycle. Well, CentOS doesn’t have any exact release cycle overall. The whole new version comes after one to four years just after the release of the respective RHEL version. It takes a few months to arrive an update for any version. They don’t have a fixed period, but they have long time support. On the other hand, Ubuntu has its frequent update release cycles. After every six months, they release an update with free support, though this support is for a short time. Every fifth release comes with long-term support. Well, you can use both CentOS and Ubuntu for corporate server or business website or web hosting. But, with CentOS, you get more advantages with its high performance. I’m not sharing my opinion. People are sharing their experiences. According to them, CentOS is better to choose from CentOS vs Ubuntu Performance argument. You already know that CentOS doesn’t offer frequent updates. The reason behind this feature is every time the CentOS developers develop a new version or update; it takes a very long time to test it. That’s how whenever they release a new version it’s more secure and stable. Besides, most of the control panels provide supports only for CentOS. So, in case of handling a lot of clients and control panel in web hosting, CentOS would be better than Ubuntu. Undoubtedly, Ubuntu wins the CentOS vs Ubuntu performance fight according to the gaming experience. Of course, you have to choose such games those are supported on Ubuntu. Except that, Ubuntu is a better platform for gaming. Developers really didn’t give priority to play games on CentOS. So, if you’re a true gamer or just play games for fun, Ubuntu should be the better option than CentOS. Its gaming performance will be better. Ubuntu and CentOS, both have their own community support. Ubuntu gets both official support from Ubuntu and corporate support from Canonical. Besides, it gets huge community support, and that’s also free. On the contrary, CentOS is a derivative of RHEL, but the Redhat doesn’t provide any official support to CentOS. But CentOS has great free community support. I can’t tell you what’s better for you. You have to choose yourself. I’m just sharing you the important facts you should know. You may still hesitate to pick one. It’s always better to understand practically than reading an article. If you’re a new user, you should give both distros a try. Then you can realize what is actually better for you. There’s no harm to try both of them for once at least. Both of them are entirely free. The experienced users are advising that people should go with CentOS if it’s for their business. Otherwise, Ubuntu is also a great Linux distro. Again, the decision is yours to choose one. Tell us about your experiences, questions, and suggestions in the comment section below. Don’t forget to share the article if you like it. Congratulations to Benjamin Tyger and Jason Nichols for actually saying something useful. I am rapidly coming to the conclusion that Linux fanbois are chronically inarticulate and have no idea how to explain anything other than they hate whatever you choose, because it is “Stupid”. Explain the benefits clearly and illustrate what you say where that helps (most cases). The endless uninteresting histories of the convoluted origins from other equally opaque distros do not help. I think choosing the familiar one is good enough. All distributioncan do the job. There are a few important facts this article missed. * Ubuntu LTS versions are only supported for 5 years. Redhat / Centos releases are supported for 10 years. Ubuntu gets more frequent version bumps because of the quicker release cycle. This let’s the administrators / users user more contemporary software. * Ubuntu LTS supports in-place upgrades. This is an important feature for both home and business desktops. Redhat / CentOS does not support this. * CentOS is a derivative distro. While this isn’t alway a bad thing, it can sometimes lead to slower release of security patches. 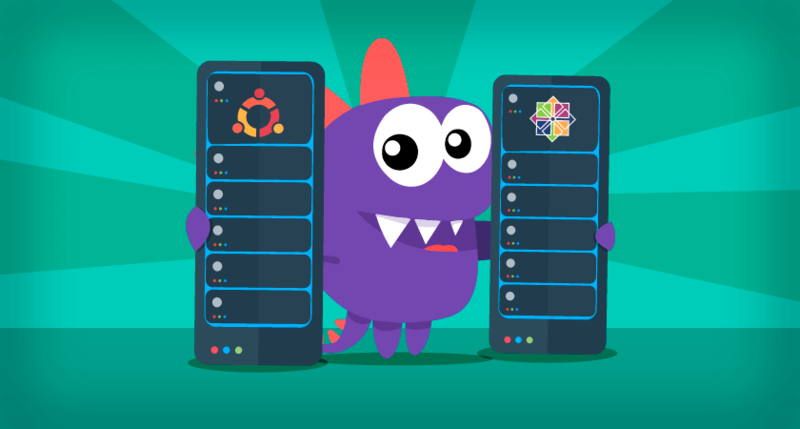 CentOs and Ubuntu are different beasts designed for completely different markets. Ubuntu is designed from the ground up to be a desktop OS and then they released a server edition as an afterthought. CentOs was designed to be RHEL without a paid-for support contract. It is built specifically for use as a server environment with desktop features added to make system administration easier. I like this articles, its very interesting knowladge for CentOS vs Ubuntu. Currently i am using CentOS for personal and corporate purpose . And also very familier to Ubuntu both are very good platform to manage the infrastructure, now come to the point as i said i am currently using the CentOS, this is more secure to Ubuntu and also web hosting feature . So recommend CentOS is good for any organization. Why is Ubuntu not secure? What makes It not secure?